[S709] Diocese of Antigonish, Nova Scotia, Canada , Birth record of Allan Christopher Druhan, page 292. [S709] Diocese of Antigonish, Nova Scotia, Canada , Birth record of Elisa Druhan, page 294. [S709] Diocese of Antigonish, Nova Scotia, Canada , Birth record of Lawrence Druhan, page 294. [S709] Diocese of Antigonish, Nova Scotia, Canada , Birth record of Caroline Druhan, page 295. [S709] Diocese of Antigonish, Nova Scotia, Canada , Birth record of Christopher Druhan, page 295. [S709] Diocese of Antigonish, Nova Scotia, Canada , Birth record of Michael Francis Druhan, page 296. [S709] Diocese of Antigonish, Nova Scotia, Canada , Birth record of Mary Ann Druhan, page 296. [S711] Donald Gregory, History of the Western Highlands & Isles of Scotland from A.D. 1493 to A.D. 1625, page 10. [S709] Diocese of Antigonish, Nova Scotia, Canada , Birth record of Angus Alexander Beaton Gillis, page 304. Paul’s son William, who was infefted in the family estate in his father’s lifetime, seems to have fallen into money difficulties. In 1697 he and his father were put to the horn; in 1708 he had to grant sasine of his lands of Kinchyle, Dores, Chapelton, Achnashangach, and others, to Mackintosh of Borlum, on a bond for 8000 merks; and ten years later Mackintosh of Culclachy held a wadset over Dores and Chapelton for £5000. Biography*: AEneas is believed to have been living in 1745, so that his brother, Gillies Mor, who played a heroic part then, was not "of Kinchyle" as is generally stated. At the proving of his will he was described as son to Kinchyle and late tacksman at Dunachton, domiciled at Dalmagerry. Among his property was a copper still valued at seven pounds; in the "List of Persons concerned in the Rebellion" he is described as a "brewer "; and it has been conjectured that, his farm at Dunachton having proved unsuccessful, he was the innkeeper at Dalmagerry. 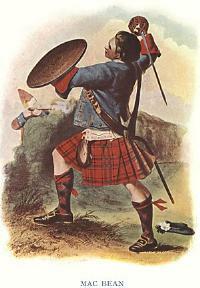 Brewer or innkeeper, Major Gillies MacBean stands out as one of the most valiant figures on the Culloden battlefield. Six feet four and a half inches in height, and armed with claymore and target, he was a formidable figure. When the Argyll militia broke down a wall on the right, which enabled the dragoons to attack the flank of the Highland army, MacBean set himself at the gap, and cut down man after man as they came through. Thirteen in all, including Lord Robert Ker, had fallen under his strokes, and when the enraged enemy closed round him in numbers, he set his back to the wall and proceeded to sell his life as dearly as possible. An English officer, struck by his heroism, called to the soldiers to "save that brave man," but at that moment the heroic Major fell, his thigh bone broken, a dreadful sword cut on his head, and his body pierced with many bayonet wounds. His widow is said to have composed a pathetic lament to his memory—Mo run geal oig, "My fair young beloved." His fate was also enshrined in a set of verses which appeared in a northern periodical and have been attributed to Lord Byron. Should he prove the true son of my Gillies MacBain!" Biography*: Mr. A. M. Mackintosh in his History of the Machintoshes and Clan Chattan quotes a number of charters and bands which show that the MacBeans took an intimate part in the affairs of the Mackintosh chiefs. [S709] Diocese of Antigonish, Nova Scotia, Canada , Birth record of Catherine MacDonald, page 325. [S709] Diocese of Antigonish, Nova Scotia, Canada , Birth record of Duncan MacDonald, page 327. [S709] Diocese of Antigonish, Nova Scotia, Canada , Birth record of Mary Jane MacDonald, page 327. [S709] Diocese of Antigonish, Nova Scotia, Canada , Birth record of Dougald MacDonald, page 329.